Got that right! It does look pretty fab. Things are getting real fast. 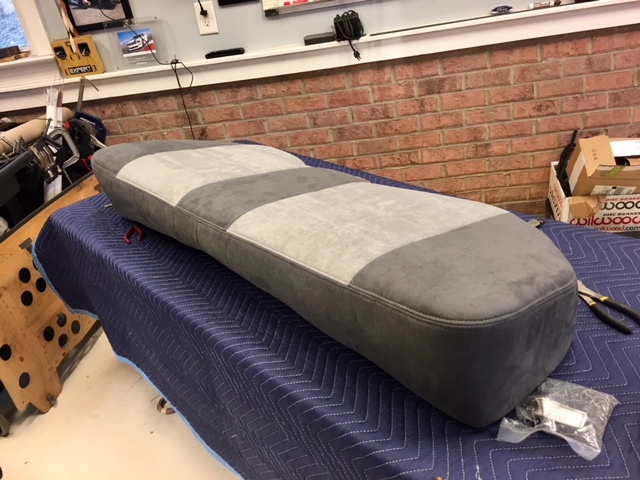 Jeff G and I are learning a lot of upholstery work and it turns out it isn't too hard. It's tedious, but it isn't difficult. Definitely my least favorite part of restoring a car but it sure beats the hell out of dropping off your stuff at a shop, waiting two months, and coming back to find out it isn't exactly what you wanted. Too many pitfalls in that so to avoid that DIY. 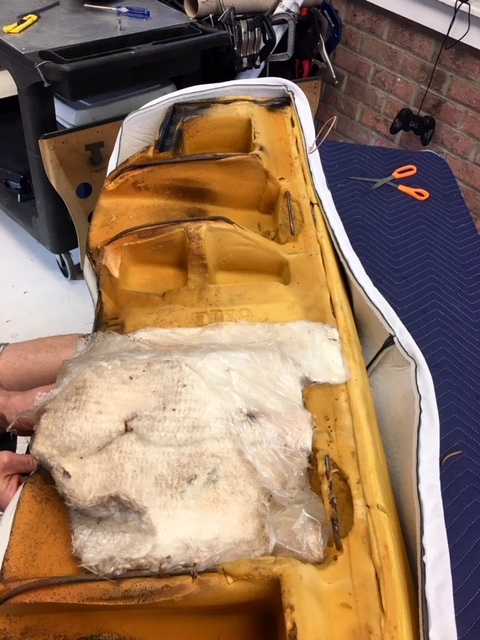 Taking apart the nasty rear seat bottom. The foam was in good shape but I cut thin shims of foam to bring up one side of the cushion. I don't know where the pictures of that went though. After tearing it all apart the new cover goes on. We put a long piece of wire in the outside sleeve pocket here and secured the cover with hog rings and a lot of profanity. Lots of pushing, pulling, and messing around with it. The end result was good though. And we did the same to the seat back cushion but again I don't seem to have pictures of the process. Here is was the same, except I bought an air stapler to help with securing the fabric to the backing board. Hog rings were not used in this application so I have a new tool, yay. In it goes and it looks sweet. Better than it ever looked in the 80s. And now on to the fronts. We have covers and new foam from TMI that work with certain Fox seat pans. We have three sets of Fox seats, 85 SVO, 85 LX, and some 89ish GT seats. Of course, we picked the wrong seats to disassemble first. As we suspected we needed the SVO seats so we starting cutting those up. Not a fun job but we got all the parts we need to start. Everything works in the old SVO seats, even the cool hand pump up lumbar bladders and the manual bolster adjustment. I'm going to blast all the metal bits, paint, and we'll be ready for reassembly this weekend. 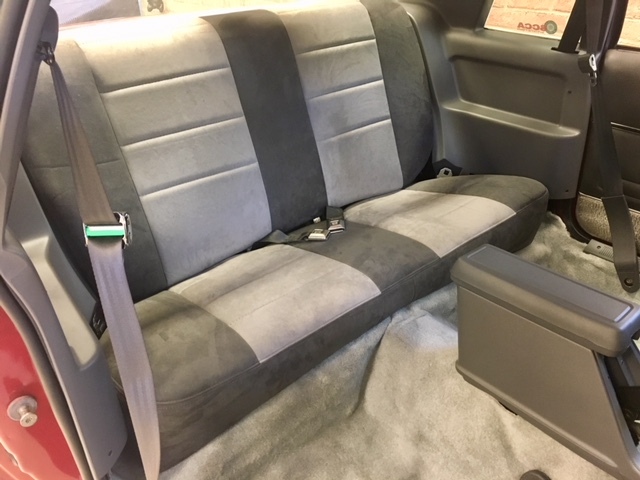 will you install new seat foam in the front seats? Save the frames the fronts will be all new. TMI makes new front foam in the SVO style which I have, and of course new covers. 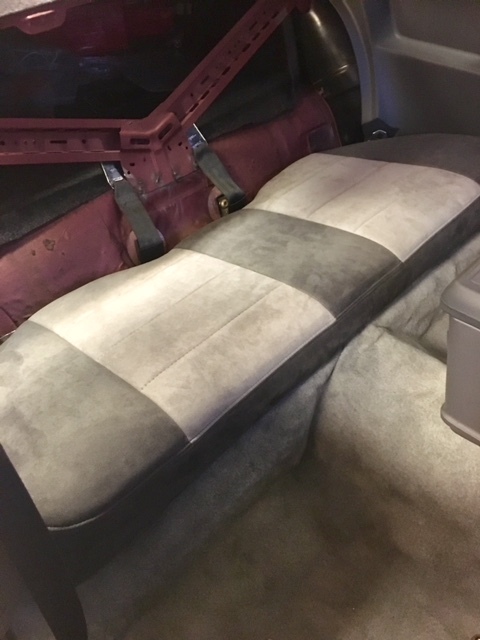 To my knowledge no company makes new rear seat foam for Fox coupes. They do make it for Fox hatchbacks, but the seat designs are totally different. Probably due to the fact hatchbacks outnumbered coupes >10:1. 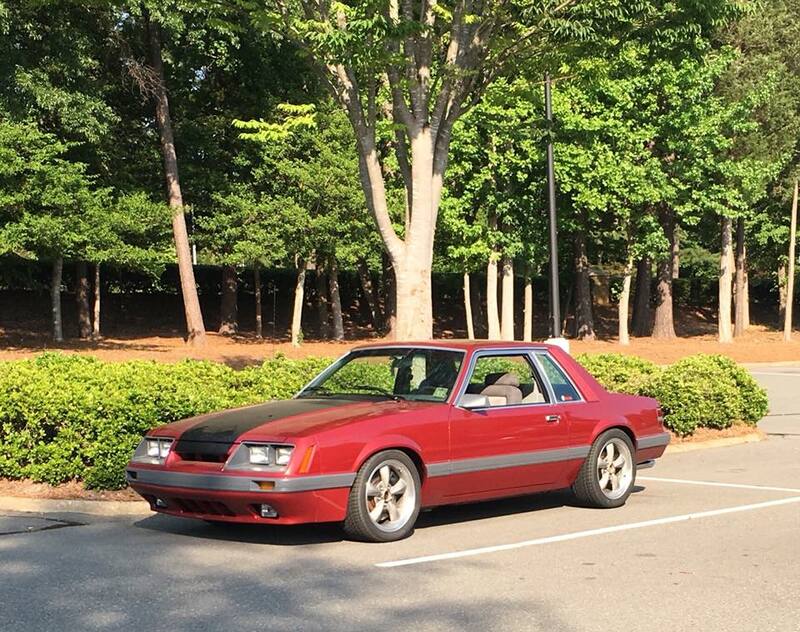 For example for this car, a 1985, 25XX Mustang coupes were made compared to 29XXX hatchbacks. Looking very nice Ron. It will be on the road soon. Glad you are installing new foam.. It actually will make the ride better. Man, this thing is perplexing. Sydney and I took it out for the first drive. All went well for a mile or two, then the ECU reset issue came back in full force. Crazy. Removed the stock air cleaner, runs great. Don't know what's going on. Car runs beautifully with a tiny round air cleaner or no air cleaner, but, with the stock big one on there is somehow some arcing to it that results in the ECU getting reset. It's nutz. And it doesn't matter if an element is in the stock air cleaner housing, ie, it isn't air flow related. Car project work was interrupted with some heavy duty work travel. The issue with the Fox running well has been identified - basically the Sniper cannot wear a metal air cleaner that comes anywhere close to the distributor. The issue is further compounded by the fact my dizzy is 1.25" taller than a stock dizzy, and, the stock Ford air cleaner is very large. In combination these two items seem to somehow cause the ECU to completely reset while running making the car extremely difficult to drive. So, I have ordered a shorter dizzy and will use a plastic K&N air cleaner for the time being. Ultimately though I want the stock air cleaner on the car and will sort this out. Otherwise the car is being driven and the ECU is learning. I took it out for an hour late Sunday afternoon and ran errands. Multiple starts and stops, no problems. The engine is running well, stays cool, AC works, all is good. I'll need to adjust the throttle return dampening again to assist with maintaining idle be the previous adjustments I did helped. Once it has some more time on it I'll get it on a dyno for proper tuning. Looks great Ron. I like the stance. That car looks great! Well done! Ron. Something easy to try: run a separate ground wire (14 ga or so) directly from the metal body of the air cleaner to the battery negative side (ground). Be certain of a zero ohms connection. The high V present on the distributor may be inducing a voltage into the aircleaner housing and causing a error in the electronics in the FI body.